Vampire in the Text: Narratives of Contemporary Art, London: inIVA, 2003. In cinematic and theoretical accounts of Bram Stoker’s novel Dracula, the role of Mina, Jonathan Harker’s wife, is usually glossed over or collapsed with that of her hapless friend Lucy; and yet, along with that of Count Dracula himself, her function in the narrative has persistently held my fascination. Mina and Dracula have long circulated in my imagination as possible metaphors of the relationship between artistic practice and its writing, connecting the enigmatic otherness of aesthetic language and what can be said about our experience of it. 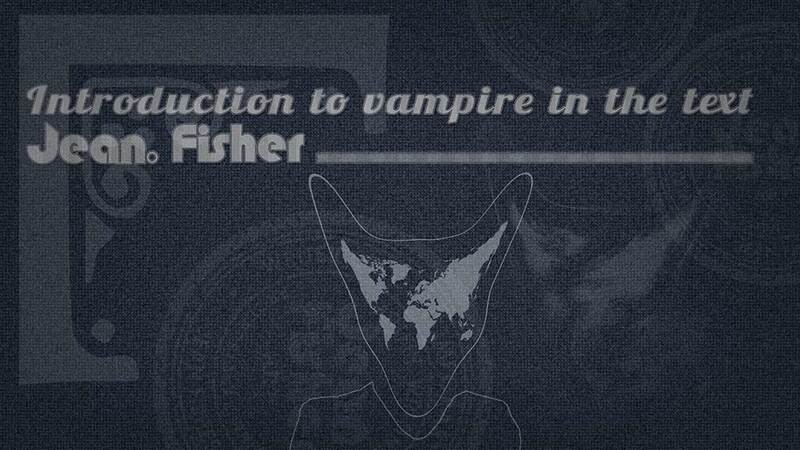 Stoker was a journalist and something of an archivist, collecting together stories and legends about the vampire and melding them into his novel. It is however to Mina that he donates his role of receiver, collator and transmitter of perceptions and affects, which she performs using the new communications technologies then at Stoker’s disposal: the typewriter, stenography, phonography, telegraphy, even telepathy. Mina’s role is not one of interpretation but of making connections. Interpretation is the function of the cluster of bourgeois male figures — lawyer, psychiatrist, anthropologist, minor aristocrat and New World capitalist — whose collective aim is to observe, analyse, hunt down and destroy the vampiric threat to emergent bourgeois dominance, replicating the panoptical and disciplinary strategies of Victorian imperialism. Dracula personifies a dangerous otherness, a phantasmatic symptom of a repressed class and ethnic power that challenges the integrated identity of the Western European bourgeois male subject, both in the vampire’s ‘intertextual’ mixed-blood foreignness and in his antiquity, in so far as he is the repository of arcane knowledge and a malingering representative of Europe’s ancient regime. The vampire has periodically been resurrected as a popular villain for, amongst other ‘delinquencies’, an unbridled (usually ‘feminised’) libidinal energy, invasive viruses and, since Marx, the seductive, all-consuming drift of capitalism itself. I have at times used the figure in this sense, but it nevertheless carries a certain ambivalence that suggests other readings. If, for instance, one posits that Western capitalism has turned us all into depoliticised, consumerist vampires, then among the strategies available to us for regaining a sense of subjective agency might be to use equally vampiric manoeuvres to infiltrate and recolonise its hegemonic discourses. I must confess therefore to some sympathy for Dracula, especially in considering contemporary intertextual practices, both in art and writing. Reading somewhat against the grain of attributes usually seen as malignant, one might say that the vampire destabilises the apparent coherence of any rationalist discourse; he (sometimes she) is the ‘un-dead’ element that, forgotten, annulled, or excluded from the discursive field, is nevertheless its invisible organising principle. The vampire haunts the circulatory systems of discourse. Dracula has neither mirror reflection nor closure: without reflection it has no other (it is otherness itself) and cannot be readily interpreted either by an already given symbolic discourse, or by itself: it acts but does not reflect; and, since it cannot die it can form no closure. It may therefore stand for a productive, creative act that does not yet possess a clear discursive boundary, a hybrid and polyphonic movement of insinuation into the interstices of the already familiar, an evanescent, non-rationalisable and unaccountable remainder that ‘contaminates’ the text with an elusive and disturbing alterity. It is the opening of a space of turbulence in which the reader or viewer, momentarily unable to map itself in the field, may experience new perceptions of existence. Hence, the title, ‘Vampire in the Text’ refers to the characterisation of experimental creative processes that in some way escape the determinations of orthodox interpretative languages, demanding in turn at least an attempt on the part of the writer to seek other forms of narration. This revolutionary potential is central to my interest in the work of certain artists emerging from cultures historically disenfranchised by colonialism. Through an engagement with the work of various artists, I have had a particularly close involvement with the relations between England and Ireland and the US and Native America, from which emerged questions regarding the role of artistic practice in the construction of political and subjective agency. With regards to US-Native American relations, I am heavily indebted to Jimmie Durham’s patient guidance. The historical and contemporary trajectories of these relations make particularly gruesome reading and, in writing about them, it is difficult to avoid falling into self-righteous outrage, whilst also acknowledging that colonialism and its legacy arose out of Western thought and attitudes, and that these must be unravelled in order to see from different perspectives. I have attempted various approaches to writing about these issues, from polemics to irony. I have also tried to focus on what is possible for me, as an ‘outsider’, to address: namely, what is revealed of these relations through American mass culture, and how the artistic and the political are mutually articulated in the practices of certain contemporary Native American artists. Their work — like that of many other artists with a cultural history of colonial repression — is often deeply concerned with how language signifies, and the way representations disseminated through the media manipulate our interpretations of the world. However, this is by no means to suggest that their work proffers some more ‘authentic’ representation, rather, it poses questions of the inauthenticity of representational languages and of the relations of power they support. In the end, it is perhaps a striving towards understanding the relations among things that informs all these writings. It accounts for my interest in art as process, in what happens between the work and the viewer, in making connections between art and various critical discourses, and probably stems from my early training in the biological sciences where it is acknowledged that things in the visible world are connected and materialised through the flux of invisible forces or energies. To experience the moment of a new use of visual language entails a degree of desubjectivation on the part of the viewer, a liberation from constraining patterns of thought. In effect, the work has to engage the viewer as a participant not an observer, to enable him or her to relinquish the ego-subject and open up to a space-time of otherness, to give ones self up to a kind of vampirish ecstasy! This is threshold state of being induced by an encounter with uncertainty, a prelude to the opening of a new horizon of meaning. For any artwork to produce this moment of affectivity depends on the way it understands and structures its relationship to the viewer as a participant in its production of meanings. It has to do with the way the self is inscribed into the field of possible meanings opened up by the work. If one can still speak of an ethical or political dimension to art, it is precisely this creative moment when it becomes capable of shifting existing perceptions of reality. Thus, the experience of art referred to here is not based directly in any prior knowledge or reason since this would presume a fully conscious subject. It is on the contrary a suspension of knowledge and reason, an encounter with something that has no prior referent: a sensation of speechlessness, limitlessness or loss of boundaries between subject and object, between the corporeal and incorporeal that may even provoke a spontaneous laughter. It is perhaps what Freud described as the ‘oceanic’ feeling, although he admitted he had no experience of it. In any case, this rendering mute is not a return to some pre-subjective state, nor is it a function of the psychological subject, but an experience of the re-embodiment of language through sensation outside of discourse as its instrumental form. If art as experimentation produces new configurations of visual language, it is the obligation of the writer to take up the challenge and seek new connections and forms of narration. Like other artists emerging towards the end of the Seventies, I felt frustrated with modernist art criticism and history— their hermetic context and attachment to description, artists’ biography and Western male genealogies— and wished to find a broader philosophical context for a writing that might reflect the tumultuous cultural and intellectual milieu of art of the end of the twentieth century.3 Unencumbered by any strict academic affiliations, I have felt relatively free to play across disciplinary boundaries, seeking correspondences with the thought of contemporary art. Since this body of writings plots my peregrinations through alien territories it doesn’t claim to present ‘truths’ or interpretations, but like Mina, tries to make connections that might form a plausible or possible narrative. The essays selected here therefore present a performance of possible points of articulation between the practices of art and critical thought, as an attempt to grapple with the intellectual and cultural concerns that shape our understanding of contemporary existence. They are divided simply into two sections: Art in Practice and Art in Context. The former section consists of essays that respond to an individual body of artwork; the latter section consists of essays concerned more with the socio-political context of artistic practices arising from a dual involvement in debates on cultural difference and questions about the efficacy of aesthetic experience itself. The starting point has always been an encounter with the work itself, an encounter then elaborated through whatever philosophical debates seemed relevant to the work. Often I have followed one particular trajectory of thought, only to realise later that I was unconsciously tracking another, and so, throughout these essays, the same body of work may reappear from slightly different angles as I sought to come to grips with what I was trying to say about it. At the same time, as I have gravitated towards certain kinds of debates and art practices, so certain artists and I have gravitated towards each other, so there is in some sense a shared or overlapping philosophical territory expressed across these essays. I have always been conscious of the form of the essay. My earliest efforts were written with a particular structure in mind (a Moebius strip, for instance, in the case of the Jack Goldstein essay), thinking of the text in ‘sculptural’ terms, although the strictures of time later disallowed this level of textual refinement. Generally speaking, however, although I might struggle to mimic an ‘academic’ style of exegesis, the predominant form, overtly or not, has been the ‘story’ or ‘fable’. My main guide here has been Walter Benjamin’s comments on storytelling: ‘Actually it is half the art of storytelling to keep a story free from explanation as one reproduces it… it is left up to (the reader) to interpret things the way he understands them, and thus the narrative achieves an amplitude that information lacks.’4 The event of art itself remains closer to the context of oral storytelling than to other forms of expressive culture. Like vampirism, art is concerned with orality, with a performance that is at the outer limits of speech. In the immediacy of its experience, in its demand for a participatory response, experimental art provides the ‘amplitude that information lacks’. If as writer I fall short of the aim of keeping these stories free from explanation, rest assured that my explanations by no means exhaust the scriptural and contextual possibilities of the work under discussion. 1. Gilles Deleuze and Félix Guattari, Kafka: Toward a Minor Literature, trans. Dana Polan, Minneapolis: Minnesota University Press, 1986, pp 16-27. 2. Daniel W. Smith, Introduction to Gilles Deleuze, Essays Critical and Clinical, trans. Daniel W. Smith and Michael A. Greco, London and New York: Verso, 1998, p li. 3. I was nevertheless inspired by Adrian Stokes, Colour and Form, London: Faber and Faber, 1937; and Leo Steinberg, Other Criteria, Confrontations with Twentieth Century Art, London and New York: Oxford University Press, 1972. 4. Walter Benjamin, ‘The Storyteller’, in Illuminations, trans. Harry Zohn, New York: Schocken Books, 1969, p 89. Vampire in the Text contains essays on the work of Judith Barry, James Coleman, Willie Doherty, Jimmie Durham, David Dye, Anselm Kiefer, Jack Goldstein, Susan Hiller, Avis Newman, Everlyn Nicodemus, Gabriel Orozco, Adrian Piper, Santi Quesada, Frank Stella and Lee Ufan, together with exploratory essays on aspects of women’s sound works, film, transculturalism, globalisation and contemporary American Indian art exhibitions.